We design Porch Enclosures which are limited only by your imagination. We ensure Top Quality in our Porch Enclosures with a sufficient variety, now you can select the option of your own choice like choosing from different types of designs, glasses, structures and colors. We provide you with Porch Enclosures which not only provide you with elegant extra space to enjoy the scenery but also alter the living experience which you have in the home. 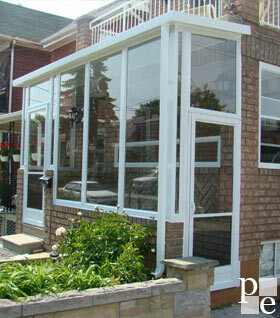 Take advantage of our custom designed Porch Enclosures to transform ordinary home into your Dream Home! - Entrance enclosure allows enjoy fresh air with no annoying bugs in the warm months. - During the cold winter months entrance enclosure protect from the harsh winter weather. - Porch or Entrance Enclosures add more living space and security. - Porch Enclosures create a unique look and increase a home's Resale Value. If your home was built with a roof or second floor sheltering the main entrance, we install custom mage glass panels and doors specifically designed to fit into these existing openings. If not, you can still have an enclosure with angled sidewalls and arched or curved top window panels!